Organic aquaculture is a method of sustainable culture practices based on long term ecologically and environmentally sound practices. Over the years, environmental awareness has grown all over the world and consumers are increasing in number for the consumption of organic products. The general principles of organic aquaculture is to produce healthy, disease free natural seafood, without the use of any antibiotics, hormones, chemicals etc. and at the same time, protecting the environment from all adverse conditions. With the concern over health and environment, the demand for organic products is increasing in the global market. Organic aquaculture essentially protects the health of consumers by reducing the overall exposure to harmful chemicals and antibiotics. It is an accepted method of production in a sustainable and eco-friendly manner. Considering the growing market for organic products, the Marine Product Export Development Authority (MPEDA) has identified organic aquaculture as one of the potential thrust areas for development. In order to implement the programme, MPEDA initiated the India Organic Aquaculture Project (IOAP) during 2007, with the support of the Swiss Import Promotion Programme (SIPPO), Switzerland. The IOAP project was successful in developing certified stake holders such as (1) certified organic shrimp/scampi hatchery (2) certified organic feed mill (3) certified organic shrimp / scampi farm and (4) certified organic seafood processors. During the first phase of IOAP, the certified hatchery for both scampi and shrimp, feed mill for the production of organic feed organic processor have been established. It is a proud achievement of the IOAP that the organic scampi farmers from Kuttanad (Kerala), were the first producers of organic scampi in the World (2008). The European Union (EU) has made it mandatory for organic aquaculture products imported in to its member countries to follow the EU Standards from July, 2009. Therefore, framing country standards would be a more viable option, to equate the same with EU standards. In this connection, the National Standards for Organic Aquaculture are being finalized by National Programme for Organic Production (NPOP) under Government of India in consultation with various organizations. 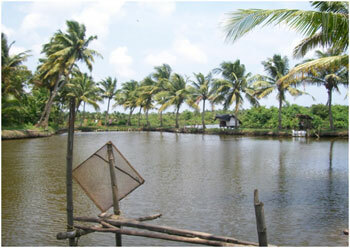 The organic standards for aquaculture products are mainly prescribed by certifying agencies from the private sector. However, the higher cost of certification appears to be one of the major constrains for farmers to commence immediate development of the programmes. In this regard, the Agricultural and Processed Food Products Export Development Authority (APEDA) has taken steps to evolve National Standards for Organic Aquaculture Products in India.